If anyone could use a hit product right now, it’s Sony. But its latest smartglasses won’t win people over from Google Glass despite having a better display. The Japanese conglomerate is reeling from the massive hack of its U.S. film arm, and will put on a brave face at next month’s CES, where it plans to show off the head-mounted display. The Single-Lens Display Module announced this week is designed to attach to different kinds of eyewear and provide high-res color graphics in the corner of your vision. When I got to mess around with the prototype at Sony’s headquarters in Tokyo, I couldn’t resist the temptation to compare it to Google Glass, but more on that in a bit. Attaching the unit to a pair of glasses with spaces in the arms was a snap. The device has a simple albeit clunky design, with a battery and control board resting on either arm of a pair of glasses, and joined at the back by a power cord. Although the control board side is slightly heavier than the battery side, as it contains electronics such as Wi-Fi and Bluetooth modules, as well as the display and 16GB of storage, it still feels well-balanced and light at about 40 grams. The prototype also had a camera in the control board that will probably not be included when it’s released as a product. Mass production is slated to begin some time in 2015. The standout feature of the prototype is its OLED display. Sony has used its OLED know-how in electronic camera viewfinders and professional monitors, but for TVs it has stuck to LCD-based 4K screens instead of OLEDs. 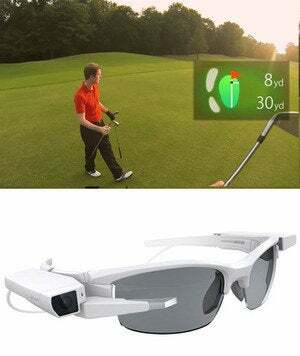 While the OLED microdisplay in these smartglasses is tiny at 0.23 inches, it presents a relatively high resolution of 640 by 400 pixels, the equivalent of a 16-inch display 2 meters away, and can cover all of the sRGB color space. In the corner of my right eye was a small rectangle of eye-popping, color graphics showing a golf range and driving directions. It was easy to see, and is supposed to be highly visible in any lighting conditions, inside or outside. The imagery was reflected through a slim, transparent optical unit that was really unobtrusive and didn’t distract from my view of the meeting room at Sony at all. It’s not in-your-face like the SMS messages that can appear in the lenses of Sony’s other wearable display prototype, the lower-res, bulkier SmartEyeglasses. The OLED glasses prototype was only working in demo mode, rotating through several graphics presentations, and the touch sensor under the control board wasn’t on. But it seemed like a relatively natural spot for an interface. 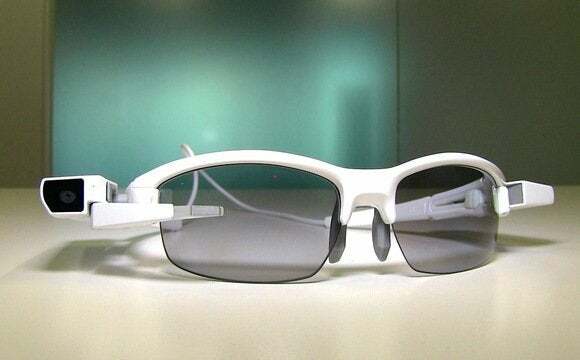 Resolution, design and interface are where the smartglasses will go up against Google Glass. I found Sony’s display to be much easier to see, and with better resolution, than the prism on Glass, which I found obtrusive. Both smartglasses are equally bulky but Google’s has voice command, making it generally easier to use, and Sony’s prototype does not. A microphone and the camera could be added depending on talks with potential users, a Sony official said. Sony is promoting the glasses to businesses, with workplace users such as factory maintenance staff in mind. But it’s also thinking of outdoor sports enthusiasts and people who use action cameras. The glasses are still under development, with no price announced, but the trim, quality display that exploits Sony’s OLED strengths is exactly the sort of wearable it should have been pushing a few years ago if it had wanted to be ahead of the curve. Google Glass still has to win widespread enthusiasts, of course, and wearables remain anyone’s game for the taking. The question is how much Sony wants to win.